Apple has made a few changes to the app store on iOS 6. 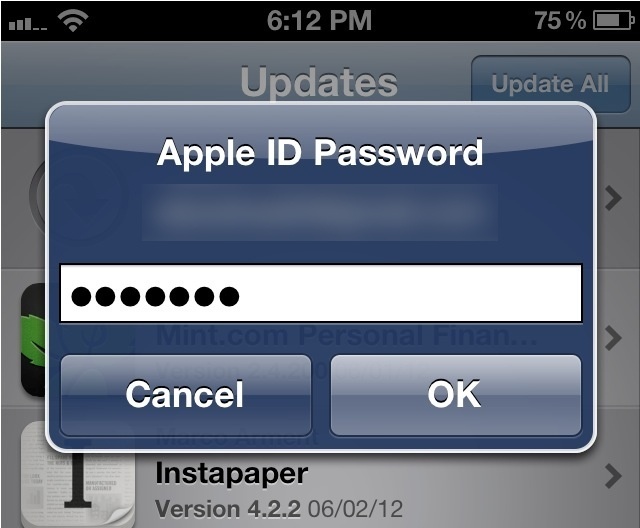 As well as a new look, Apple also dumped the need for you to enter a password when downloading updates for apps. In the beta 3 version which launched last week, Apple also got rid of the need to enter a password when downloading a free app from the app store. Although we can’t say you’ll be glad you woke up to read this today, it’s still a nice small shift to making things run a little smoother. If Apple keeps the change it will mean that the only times you need to enter a password in the app store will be for downloading new paid apps. Also note that you’ll also be required to enter a password for in-app updates if you have them enabled. iOS 6 is expected to launch at the same time as the new iPhone 5 which is rumoured to be October. We suspect that just like the iOS 5 launch that Apple will be doing something extra with the OS just like the 4S got Siri, we think the iPhone 5 will get something unique to further give a reason for people to buy it. Perhaps with the new Passbook app using GPS on the 4/4S, Apple might opt to include NFC on the iPhone 5 which will also make use of that new app. We’ll find out more in October. One last note… some have rumoured the announcement to be as early as next month although we expect it will be October to keep 6 months between the iPad and iPhone.